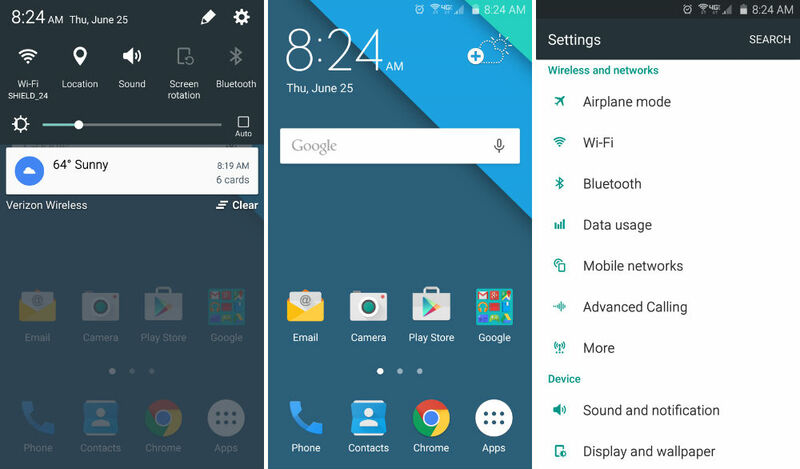 A new theme based off Material Design is available this morning to users of the Galaxy S6 and Galaxy S6 Edge. The theme can be applied directly from the Themes Store or your Samsung device, and if you are a fan of Lollipop and vanilla Android in general, this theme should excite you. Most traces of the TouchWiz coloring have been wiped out, being replaced by more subtle, neutral tones. And frankly, this makes us happy. In total, quite a few apps look different once the theme is applied. You will see a new Dialer, Messages, Lock screen, and Calendar for starters. Most importantly, your notification shade will be changed up drastically, and the Settings menu will look much better. To download this theme and apply it to your phone, open up the Themes Store on your Galaxy S6 or S6 Edge, locate the What’s New section, then select the “Material” theme. Once located, simply hit Apply. The theme will set itself and you are all done. No reboot or anything are required. Cheers to Samsung for allowing this.